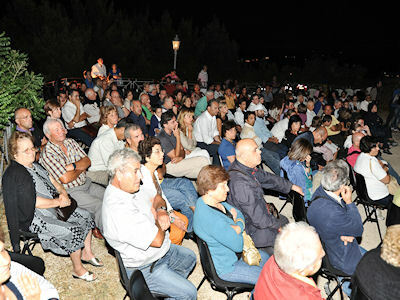 Calatafimi Segesta, Eufemio Castle - August 5, 2011 - The audience during Presentation of the documentary "Calatafimi-Segesta: city of myth and history"
Trapani, Episcopal Seminary - May 29, 2011 - Presentation of the documentary about "Trapani, la Settimana Santa"
Santa Ninfa - January 14, 2011 - Presentation of the documentary about Santa Ninfa, the land of karst cave in the Belice Valley. 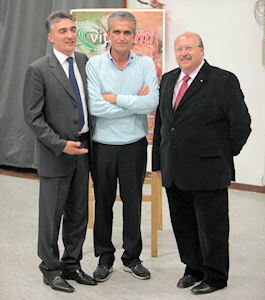 "From the left: Giovanni Montanti, Marianna Conforto (Department of Culture) and Paulo Pellicane (Mayor). 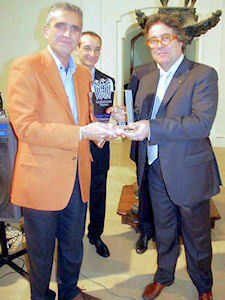 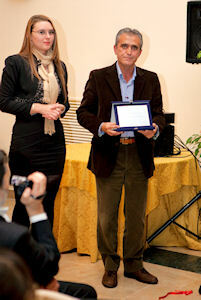 Trapani - December 20, 2010 - Pepoli Museum - The Superintendent Sebastiano Tusa awards Giovanni Montanti of the "CONFINDUSTRIA 2010" premium for culture. 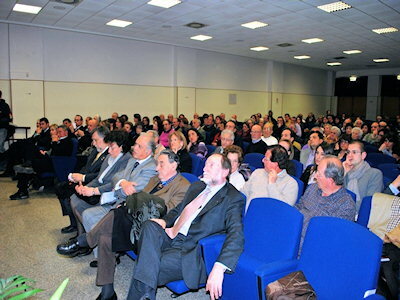 At the center of the picture you can find Davide Durante (President of the Confindustria - Trapani). 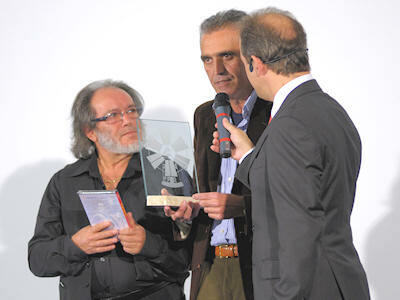 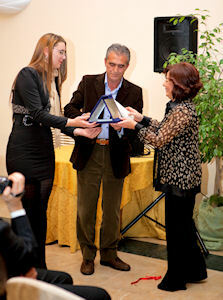 Trapani - December 4, 2010 - Giardino Eden - Giovanni Montanti received the award of "CLUB UNESCO DI TRAPANI 2010"
Trapani - December 3, 2010 - Hall Institute 'Calvino' - Presentation of the "BASTA VA! 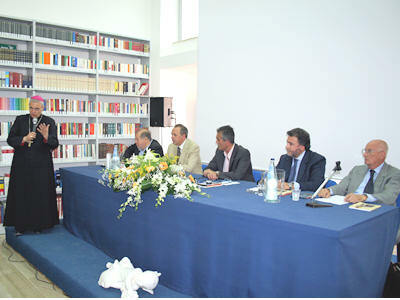 MOMENTI DI VITA SCOLASTICA IN UN LICEO DEI GIORNI NOSTRI". 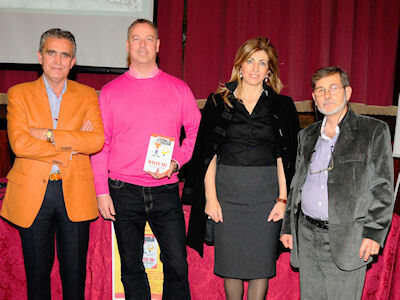 From the left: Giovanni Montanti, Vincenzo Sinacori, Anna Maria De Blasi, Gianni Grimaudo. 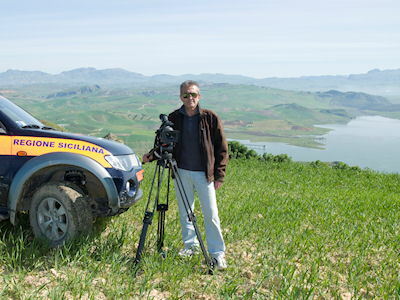 Trapani - 2010, March - Giovanni Montanti on the Pizzo Gallo (650 metres above sea level) while shooting the documentary about Poggioreale. 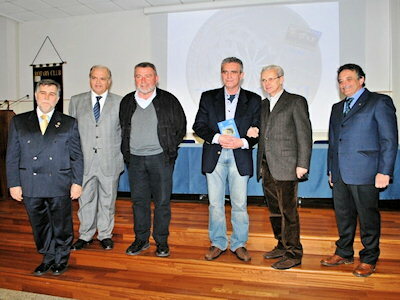 Trapani - 2010, 20 March - University of Trapani - Presentation of the documentary "Trapani, the monuments"
Trapani - Giovanni Montanti (right) and Gianni Basciano (left) while shooting the documentary about Trapani. 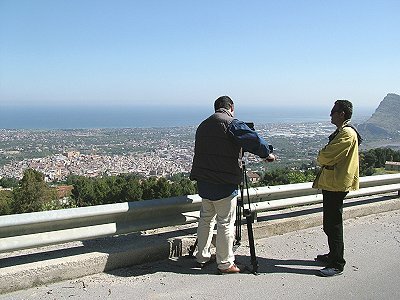 Castelvetrano and Selinunte - Giovanni Montanti while shooting the documentary about "Castelvetrano - Selinunte". 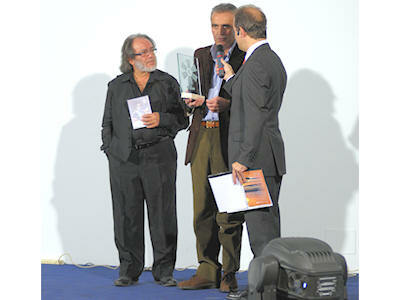 Trapani - December 8, 2008 - Hotel Baia dei Mulini - 6th Provincial Prize for Art, Culture, Sports, Entertainment - From the left: Giuseppe Vultaggio (presenter), Giacoma Cordio (award-winning sports), Graziano Cecchini (	Guest of honor); Eliana Urbano Raimondi (award for music), Vanni La Russa (Chairman of the organizing committee), Giovanni Montanti (Rewarded for culture) e Salvo Vultaggio (Special Prize). 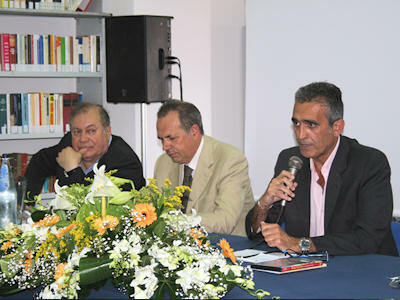 June 2008 - Municipal Library of Paceco - Celebration of the 400-th Anniversary of the Foundation of the town - (from the left): Alberto Barbata (writer), Dott. 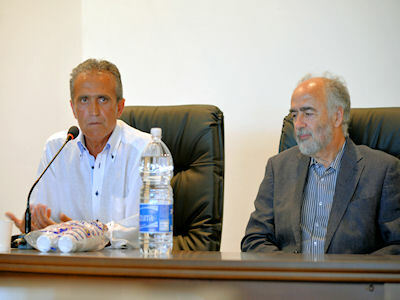 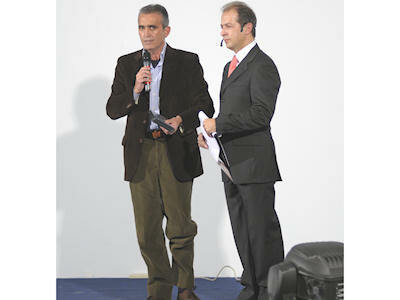 Vincenzo Aiello (Officier of the Municipality of Paceco), Giovanni Montanti (director). 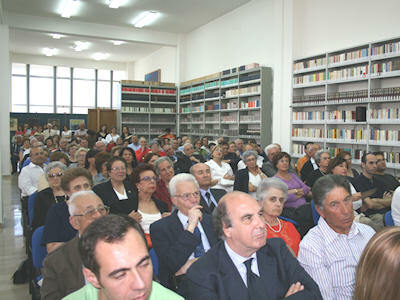 June 2008 - Municipal Library of Paceco - The people those who were present to the Celebration of the 400-th Anniversary of the Foundation of the town of Paceco. 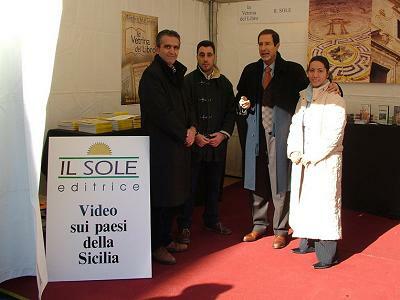 The documentary "Paceco, una storia lunga 400 anni" and the book "Paceco, tra Spagna e Sicilia" were presented during the Celebration. 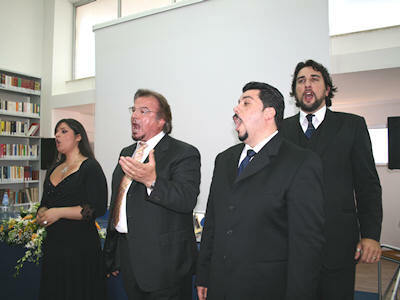 June 2008 - Municipal Library of Paceco - Celebration of the 400-th Anniversary of the Foundation of the town - Performance by tenor Pietro Ballo and the Soloists of the Accademia Lirica del Mediterraneo. 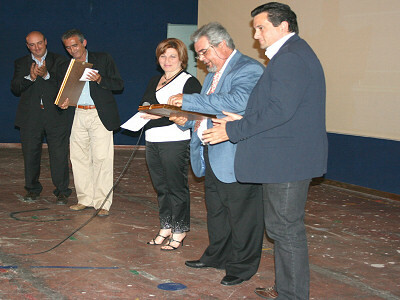 June 2007 - Cine-Teatro Martorana di Corleone - (from the left): Mario Giuseppe Castro (President of Confraternity Maria SS. 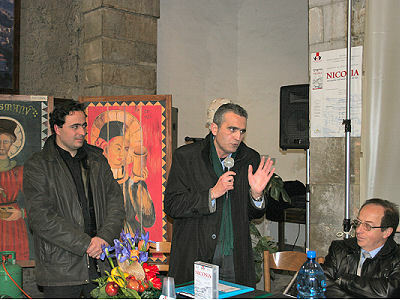 Addolorata), Giovanni Montanti (gifted of a bas-relief of bronze made by Biagio Governali, a famuos sculptor from Corleone), Mariangela Gennaro (Counsellor of the Committee "Holy Friday in Corleone"), Nonuccio Anselmo (journalist and writer), Vincenzo Iannazzo (Vice Coordinator of the Committee "Holy Friday in Corleone"). 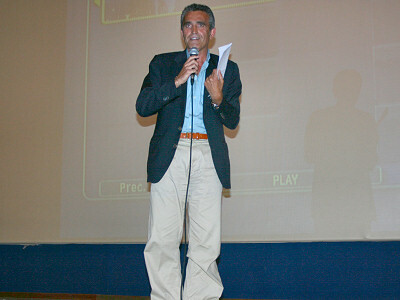 June 2007 - Giovanni Montanti in the Cine-Teatro Martorana of Corleone during the presentation of the documentary "Il Venerd� Santo a Corleone" (Holy Friday in Corleone). 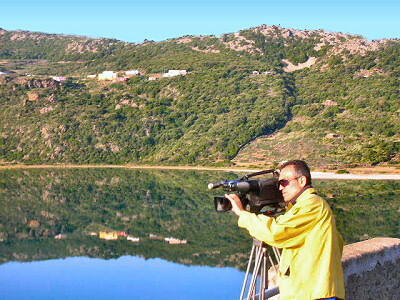 May 2007 - Pantelleria (Lago Specchio di Venere) - A scene taken during the documentary shooting about "L`asino di Pantelleria" (The donkey of Pantelleria) that Giovanni Montanti carried out with the cooperation of the Ufficio Provinciale di Trapani dell`Azienda Foreste Demaniali della Regione Siciliana. 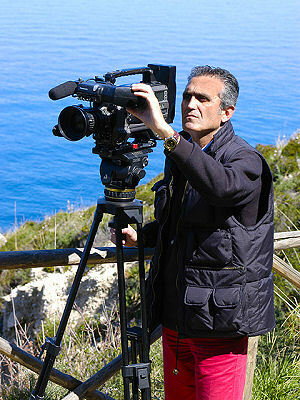 May 2007 - Pantelleria (Arco dell`Elefante) - A scene taken during the documentary shooting about "L`asino di Pantelleria" (The donkey of Pantelleria) that Giovanni Montanti carried out with the cooperation of the Ufficio Provinciale di Trapani dell`Azienda Foreste Demaniali della Regione Siciliana. 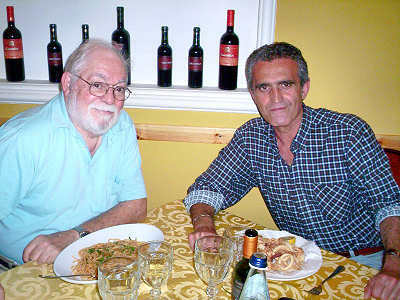 May 2007 - Giovanni Montanti and Frank Cannonito having lunch in a restaurant of Mondello (PA). 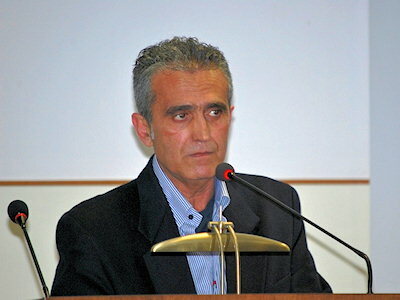 Frank Cannonito is a retired professor of mathematic. 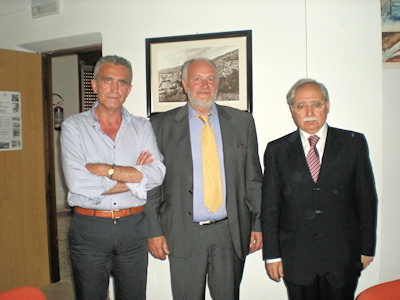 He lives in California and on May,2007 he visited for the very first time Palermo, that is the town of his father and of his grandfather too. 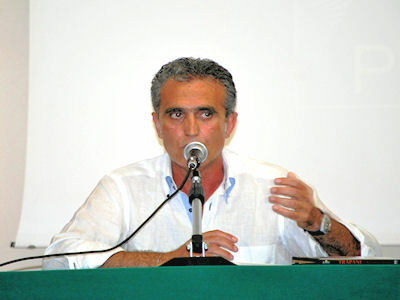 Mr. Cannonito is a candidate of the "L`Altra Sicilia" party for the curent election of the Town Council of Palermo. 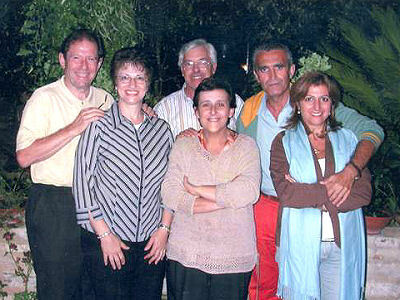 September 2006 - (from the left) Karl and Mary Antoinette Knab, Franco Virga and his wife, Giovanni Montanti and Letizia Genovese. 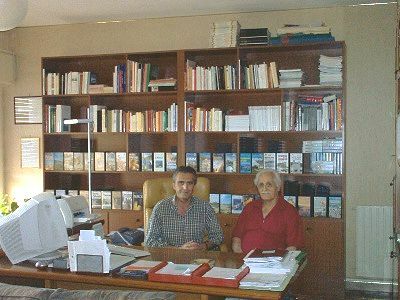 The picture was taken at the Bed and Breakfast "Al Giardino", managed by the Virga family and located in the town of Buseto Palizzolo, Sicily, Italy. 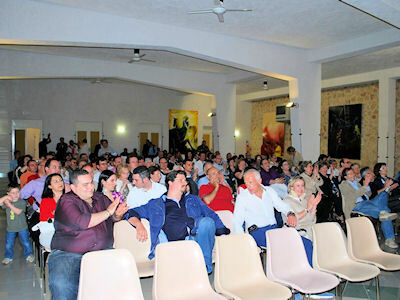 Mrs. Knab travelled from her home in Maryland, USA in order to meet in Buseto Palizzolo, for the very first time, her Italian relatives that were found thanks to the genealogical resarch conducted by Giovanni Montanti. 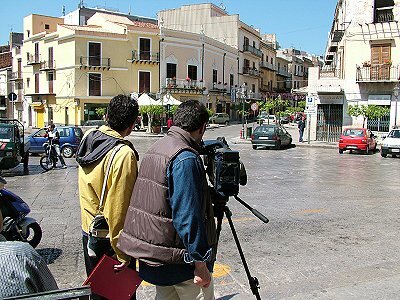 April 2006 - Giovanni Montanti during the shooting of a video. 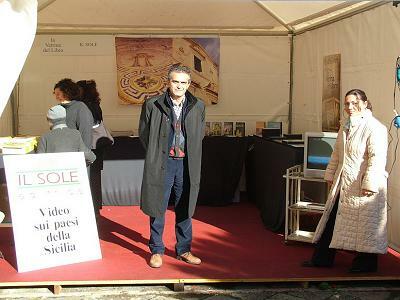 In background the wonderful sea of Mediterraneo. 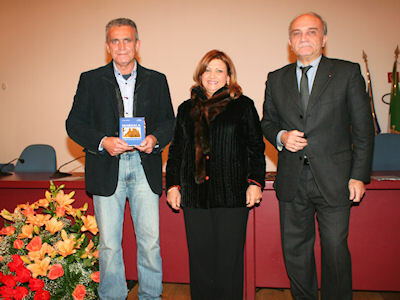 December 2005 - Ventimiglia di Sicilia (presentation of the video-documentary) From the left: Giovanni Montanti, Andrea Mannina (Mayor), Giuseppe Lombardo (President of Archeoclub), Piero Alongi (Municipal Councillor). 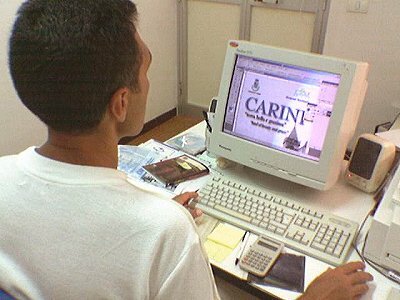 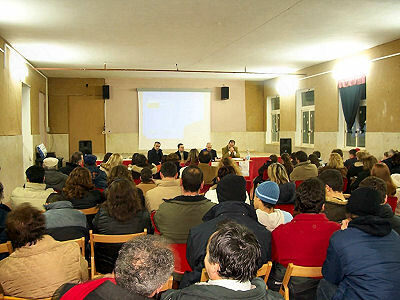 December 2005 - During the presentation of the video-documentary "Ventimiglia di Sicilia, the Princess` town", the hall will be full of people. 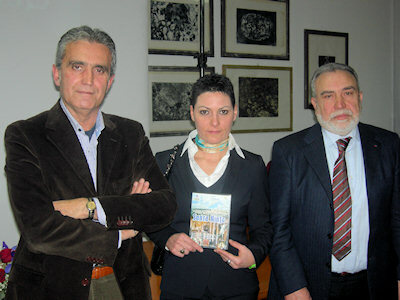 September 2005 - Giovanni Montanti, Letizia Genovese and in the middle Carmela LiVolsi-Cesario (Carmela was born in Nicosia, she lives in Chicago, she is also the sponsor of the video about Nicosia). 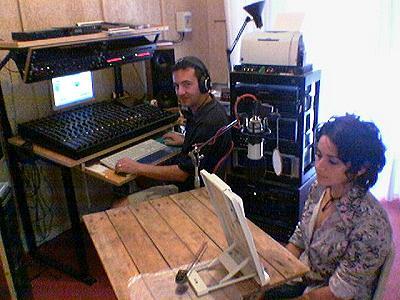 Above photo is of a holiday in a farm in Bolognetta. 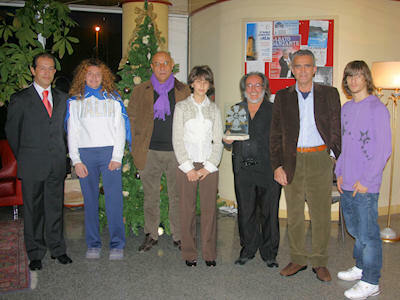 September 2005 - From left to right: Giovanni Montanti, Letizia Genovese, Michela Basso, Carmela LiVolsi-Cesario, Shurland Zapka and Riccardo Incagnone (Major of Bolognetta). 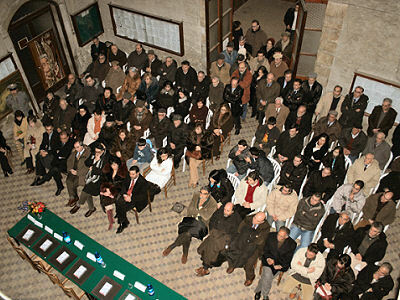 Above photo is of a holiday in a farm in Bolognetta. 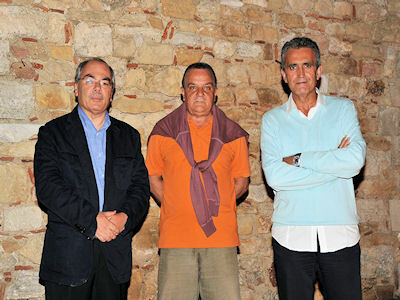 May 2005 - Giovani Montanti, Letizia Genovese e Margherita Zanellato. 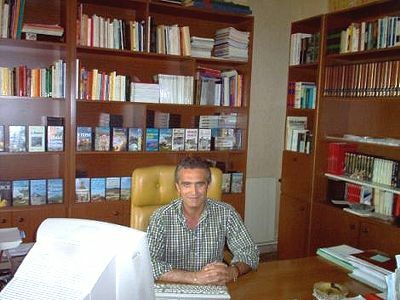 In the background the bay of Cornino and Mount Cofano (Custonaci - Trapani, picture of Maurizio Berizzi). 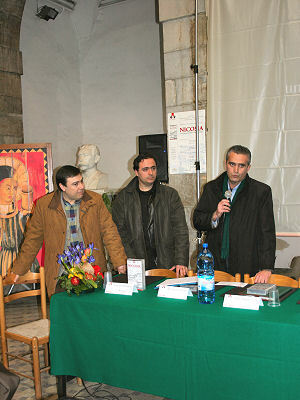 12 March 2005, NICOSIA (video presentation) - to left: Salvatore Leonardi, Adriano La Blunda, Giovanni Montanti. 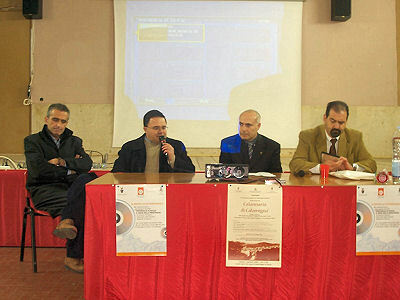 12 March 2005, NICOSIA (video presentation) - to left: Adriano La Blunda, Giovanni Montanti, Prof. Salvatore Lo Pinzino. 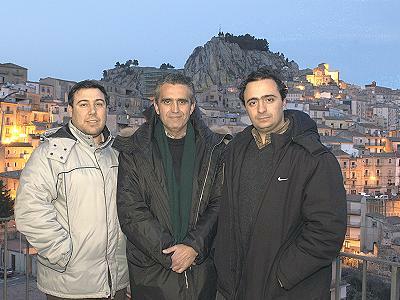 February 2005 - to left: Salvatore Leonardi, Giovanni Montanti and Adriano La Blunda in Nicosia during working the video of "Nicosia: a pearl of the heart of Sicily" (the old castle in the background). 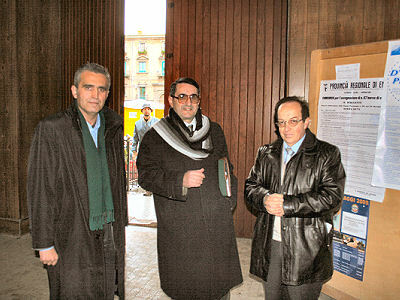 December 2004 - Giovanni Montanti, Giuseppe Cannata (President of the Pro Loco di Militello in Val di Catania) and the Honourable Nello Musumeci (Deputato Europeo) in the stand of Casa Editrice Il Sole in the cloister of the ex "Abbazia di San Benedetto" to Militello in Val di Catania during the first edition of the "Vetrina del Libro"
December 2004 - Giovanni Montanti in the stand of Casa Editrice Il Sole in the cloister of the ex "Abbazia di San Benedetto" in Militello in Val di Catania during the first edition of the "Vetrina del Libro"
August 2004 - St. Anthony`s of Padua Roman Catholic Church - Buffalo (New York) - Valledolmo Reunion - Mr. Peter Lo Iacono shows the tape on Valledolmo next to the display which was made by Mrs. Susan Jefferson.